RS Components has started production of its second comedy podcast series following the five-star rating of its popular History Makers series. 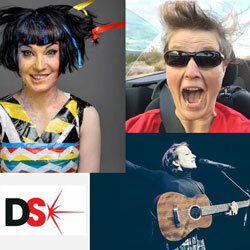 With a brand new title for 2019, The DesignSpark Podcast will highlight a cocktail of exuberant stand-up, fun facts, outlandish sketches and foot-tapping songs, giving a comedic look, in the style of BBC Radio 4’s Now Show, at some of the hottest topics in technology. Robot Wars judge, Dr Lucy Rogers, and comedians Bec Hill and Harriet Braine will be back to examine the ridiculous side of modern technology over six 25-minute episodes. The live-audience format will feature a mix of informal conversation, scripted comedy and spontaneous banter. While the first series probed into the lives of great inventors from the past, Series Two – The DesignSpark Podcast – will examine the funny side of a range of talked-about topics, from AI and robotics and space exploration to augmented human experiences and big data.